Of all the pop culture franchises, Star Trek seems to inspire some of the most extreme displays of fan commitment. From Star Trek conventions to the perennial popularity of Trek movies and TV series (including Star Trek: Discovery, which debuted in 2017), Trek fans have an intense interest in replicating (so to speak) the world of Kirk, Picard, Sisko, Janeway, Archer, Burnham, and all the other distinguished members of Starfleet. In that spirit, the residents of a fortuitously named town in the Canadian province of Alberta have capitalized on this interest by creating an outpost of Star Trek fandom set amongst prairie wheat fields. The town of Vulcan, Alberta first came into being with the expansion of the Canadian Pacific Railway (CPR) into the area in 1910. Vulcan grew up around the grain elevator built to store local farmers’ crops until the train came through to collect and then transport them on to other markets. While the town started small, with 28 residents and 14 businesses, it has now grown to a population of over 1,800. Vulcan was given its name by a surveyor for the CPR; inspired by the fact that the town sat at the highest elevation the railroad reached on the prairies, he wanted to name it after one of the Greek gods from Mount Olympus. However, Vulcan is actually the Roman god of fire and volcanoes, said to live beneath Mount Etna in Sicily or under the island of Vulcano. While the CPR surveyor got his ancient gods confused, his error has worked to the town’s advantage in recent years. Looking for a way to boost tourism, in 1995 the residents of Vulcan decided to capitalize on their town’s link to the Star Trek franchise. 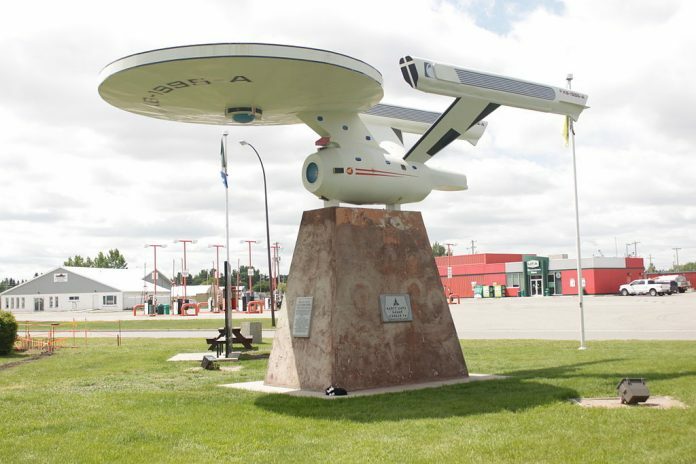 The town first built a large replica of the USS Enterprise, named the Starship Enterprise FX6-1995-A, based on the airport code for Vulcan (FX6) and the year it was created (1995). Measuring 31 feet (9.5m) in length and weighing five tons, the starship sits at the entrance to the town and has a plaque on its base welcoming visitors in the English, Vulcan, and Klingon languages. The second major construction project was a visitors’ centre built in the shape of a landing spaceship. The Vulcan Tourism and Trek Station opened to the public in October 1998, and provides brochures and information to visitors, as well as offering Star Trek-related souvenirs. Vulcan also hosts an annual event with a Star Trek theme: Vul-Con, which features celebrity guests, trivia and cosplay contests, and vendor exhibits—plus a dance and a pancake breakfast (this is a small town on the Canadian prairie, after all). Note: This is an updated version of an article that originally appeared on Interesting Thing of the Day on October 30, 2006.